In The Shade Of The Qur’an is more than ‘just another’ commentary; yet it is not too over-reaching or outlandish to be a completely new interpretation. It is an earnest, sincere and sober look at man’s contemporary achievements and difficulties in the light of the message of the Qur’an. It is an effort to vigorously explore its rich wisdom, and expand its invaluable guidance for the benefit of an increasingly ‘sophisticated’ , yet highly perplexed modern society. The work, which is by far Sayyid Qutb’s largest and most profound, spans the whole of the text of the Qur’an. It was written, and partly re-written, over a period of more than 15 years, most of which the author had spent in Egyptian prisons, during the 1950s and 1960s. In it is embedded Sayyid Qutb’s insight, highly esteemed intellectual vigor, and his widely-acclaimed literary prowess. 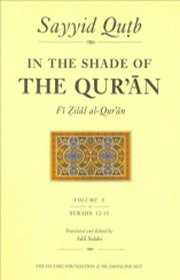 In The Shade Of The Qur’an has been universally recognized as an outstanding contribution to Islamic thought and scholarship, to which students and scholars, as well as contemporary Islamic revivalist movements all over the world, owe a great deal. Now that it is available in English, it will continue to enlighten and inspire millions more. It will take its rightful place as an indispensable work of reference for a proper understanding of contemporary Islamic thinking.